Dvaravati refers both to a culture and a conglomerate of ancient city-states in the lower plain of the Chao Phraya river. 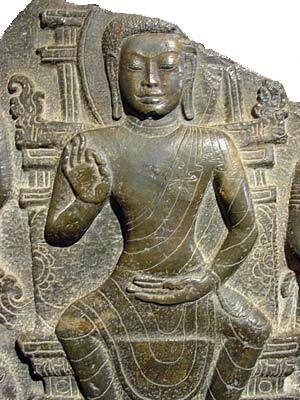 The style of art known as Dvaravati is distinct from subsequent Thai and Cambodian (Khmer) art forms. The Dvaravati region comprised present day Nakhon Pathom, Lopburi, Ratchaburi and Prachinburi. Dvaravati culture flourished between the 7th and 11th century A.D. As an example of its importance, Nakhon Pathom was the largest city in Thailand prior to the Ayutthaya era. Its influence went as far south as present day Songkhla and Pattani. To the North it reached up to (present day) Lamphun, with the city-state of Haripunchai. Haripunchai survived its southern progenitors until the late 13th century A.D. when it was incorporated in the Lanna Thai Kingdom. Stucco depicting 'foreigner' as found at Wat Phrapathom in the ancient city of Nakhon Pathom. Dvaravati consisted of a group of city-states linked together by culture and with Buddhism as its religion. The majority of the people of Dvaravati were most likely Mon, a separate ethnic group from Tai and Khmer people. However there is evidence from sculptures that Dvaravati society comprised different ethnic groups. The Mon did not disappear but nowadays live in both Thailand and Burma. While being largely assimilated into Thai culture, there still are some distinct Mon communities (like Koh Kred in the Chao Phraya river). 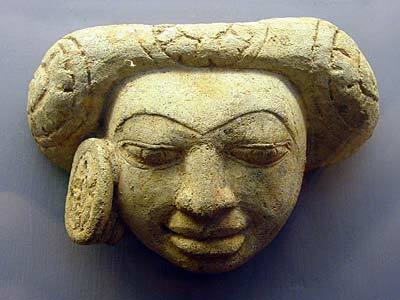 The Mon were highly skilled in stone sculptures, and stucco and terracotta mouldings for architectural decoration. Their art style was also influenced by Gupta and post-Gupta styles (India). Dvaravati art has produced Buddha images, some in Indian style with legs crossed or folded, some in so-called European style, with both legs simply hanging down. A distinctive feature of Dvaravati art is the Wheel of the Law, symbolizing the Buddha's first sermon and teachings. It was erected on pillars at Buddhist temples. Local museum in Nakhon Pathom and Suphanburi (U Thong museum) have well preserved examples of these sculptures. 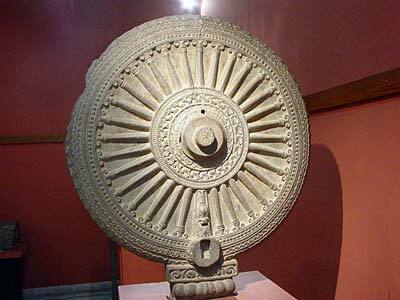 The 'Wheel of Life' (Dharmacakra) was originally positioned on a high pillar and placed in temple compounds. The Dharmacakra symbolizes the first sermon of the Buddha, as well as the teachings of the Buddha at other occasions. It should be remembered that sculptures or images of the Lord Buddha were not made during the first centuries of Buddhism. 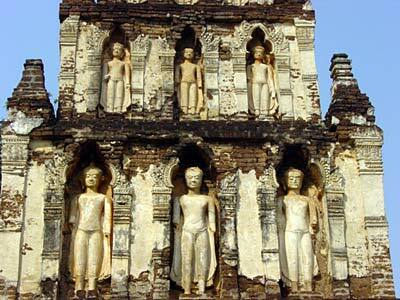 Dvaravati-Mon culture persisted somewhat longer at Haripunchai in present day Lamphun. Lamphum, very close to Chiang Mai, is certainly worth a half-day visit when you are in the area.